Ever since my first track day at COTA, I’ve been going to track events once a month. But this will be my first time at an SCCA track night event, and I wish I knew about these events sooner. Its like HPDE except its a lot cheaper, with fewer sessions and you learn at your own pace without an instructor. Harris Hill is about a 30 min drive from Austin, with elevation changes and long sweepers. 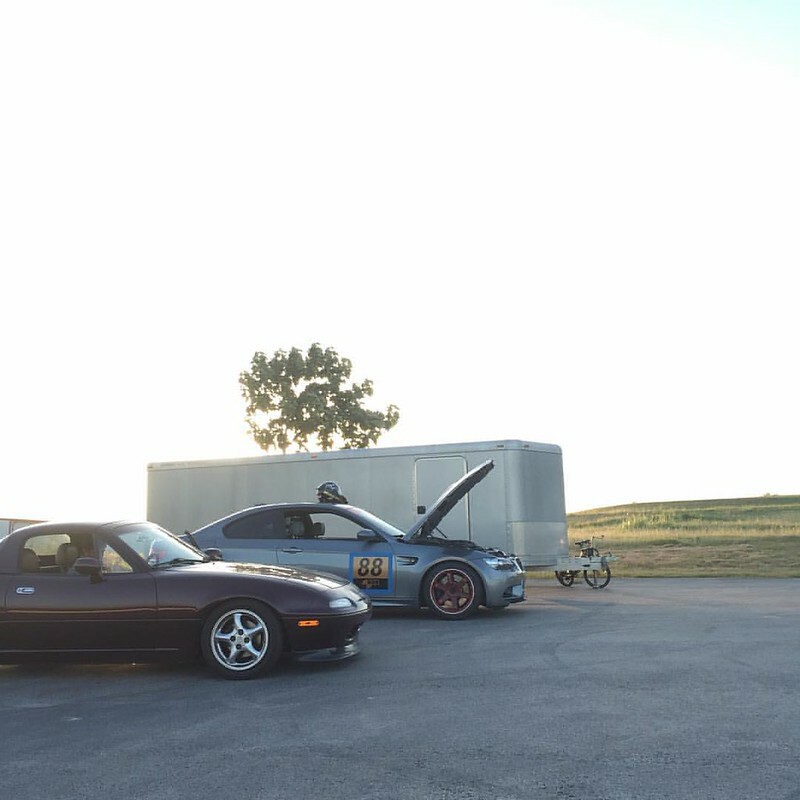 My friend Jason, with his track oriented Miata was able to join in on the action. It was our first time at this track, so we joined the novice group. Thankfully there were only 7 cars in the novice class. Probably the Texas summer heat might be to blame for low number of cars but I wasn’t complaining. I hate to race in a crowed track. SCCA track night is $150 which includes three 20 min sessions. The novice class also gets paced laps before the beginning of the first session, and drivers meeting between sessions. Luckily SCCA does offer discounts and I was able to get $25 off. The people are pretty chill and its about having fun in your car. You get to experience what a track day in a chill atmosphere. You don’t get an instructor, but in the paced laps, the lead car shows you the preferred line. I still like HPDE becuase they offer instructors and more track sessions (5), but the price sometimes is too much for some people. SCCA track night just makes it more affordable to the general public. Unfortunately my lap timer was acting up and I wasn’t able to time myself but I still had a blast. My first impression was this track is slow but its decently fast. I was able to hit 110 mph on the straights with no brake fade! The stock M3 brakes are more than capable for track use. The only time I had brake fade was at COTA with stock brakes, Im pretty sure if I get track pads and higher boiling point brake fluid then it wouldn’t be an issue. I can really feel the g forces in the long fast sweeper. Harris hill is mainly a 2nd to 4 gear track. The only thing I didn’t enjoy so much was how bumpy the track was. My suspension isn’t super stiff, but if you are not careful the bumps could upset your car and lose control. I didn’t run into any issues, but it was a rough ride that my helmet would occasionally hit the roof. During the drivers meeting, the SCCA track host gave us pointers around the track which did help avoid some of the bumps. By my third session, I was pushing the car harder and I really enjoyed the capabilities of the M3. I will be back again. 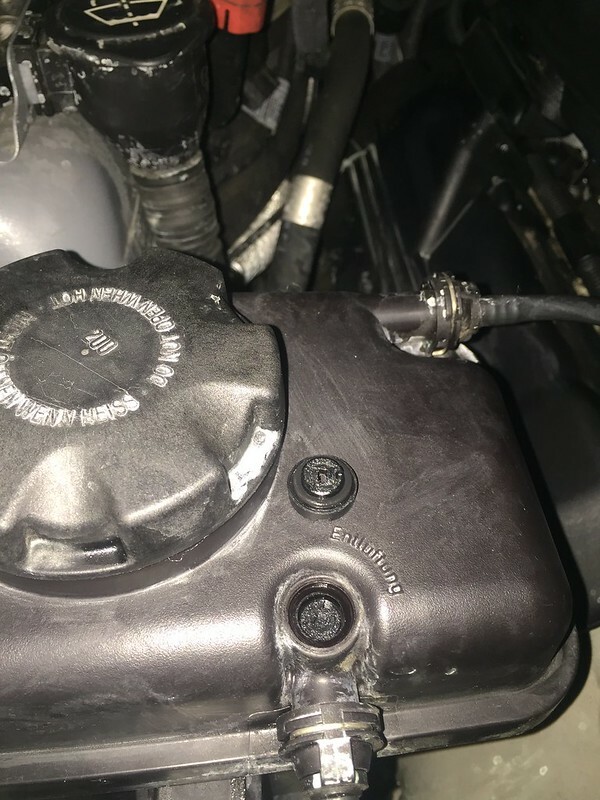 Looks like the expansion tank spilled coolant everywhere! I was totally bummed and worried that I wont be able to make it for my upcoming track day. I let the car cool down and called the guys at ABR Houston. 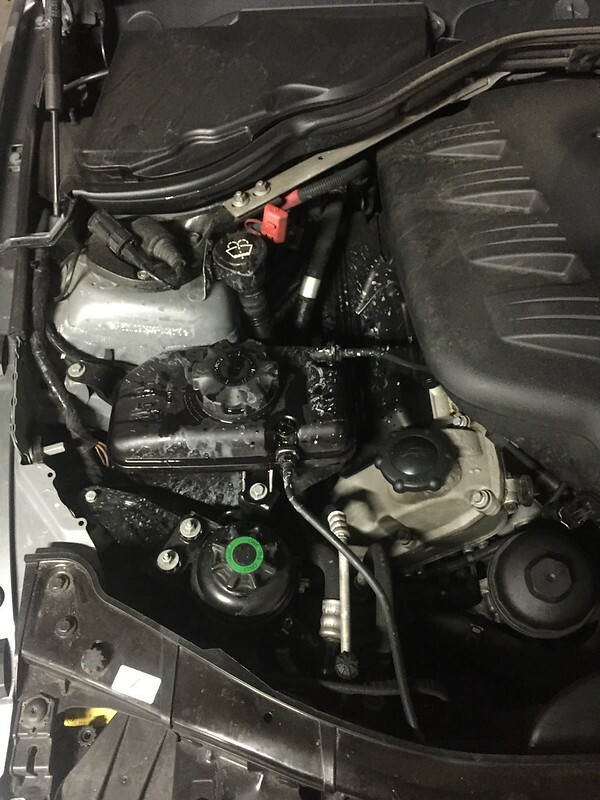 The service advisor informed me that some coolant did spill out during the radiator flush but when I first popped the hood to add distilled water the amount of spilled coolant was minimal. I didn’t really worry but I started thinking…. It only got worse when I arrived home after adding distilled water. I didn’t overfill the expansion tank since there is a bevel that tells the max level. 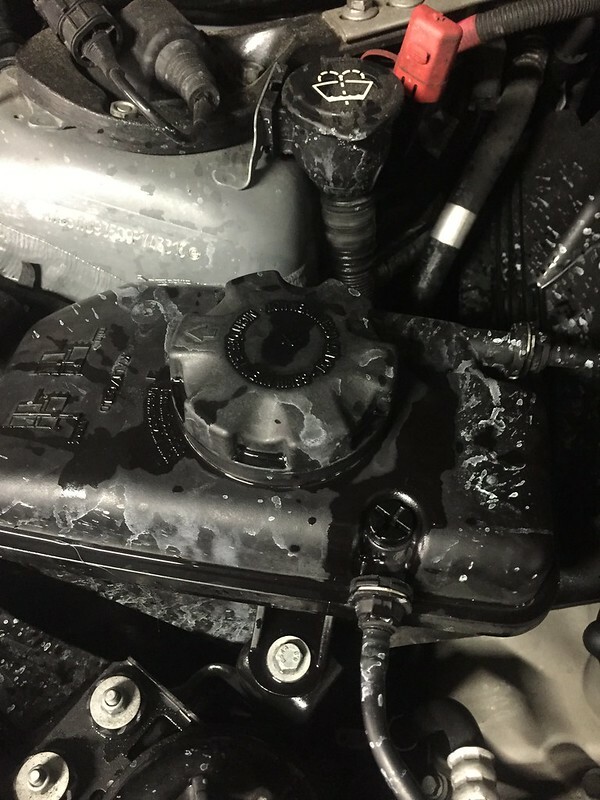 You could still see the fresh coolant around the bleeder screw. After letting the car cool and being all bummed about what happened I started to wipe the dried coolant from the engine bay. As I was wiping the expansion tank the top of the bleeder screw came off!!! Worse case scenario, I have a partial screw that is stuck in the expansion tank. I did some research and found out that the plastic bleeder screw is known to break easily. I called up ABR Houston and spoke to Alex about the situation. Alex, the shop owner, was nice enough to drive from his shop to my apartment in downtown, and this was during rush hour! Alex was able to remove the broken bleeder screw with a left handed drill bit. The left handed drill bit catches on screw and which enables the screw to turn counter clockwise. The broken bleeder screw was replaced with an aluminum bleeder screw that wont break. So I was able to make it to my track day and race without any issues. 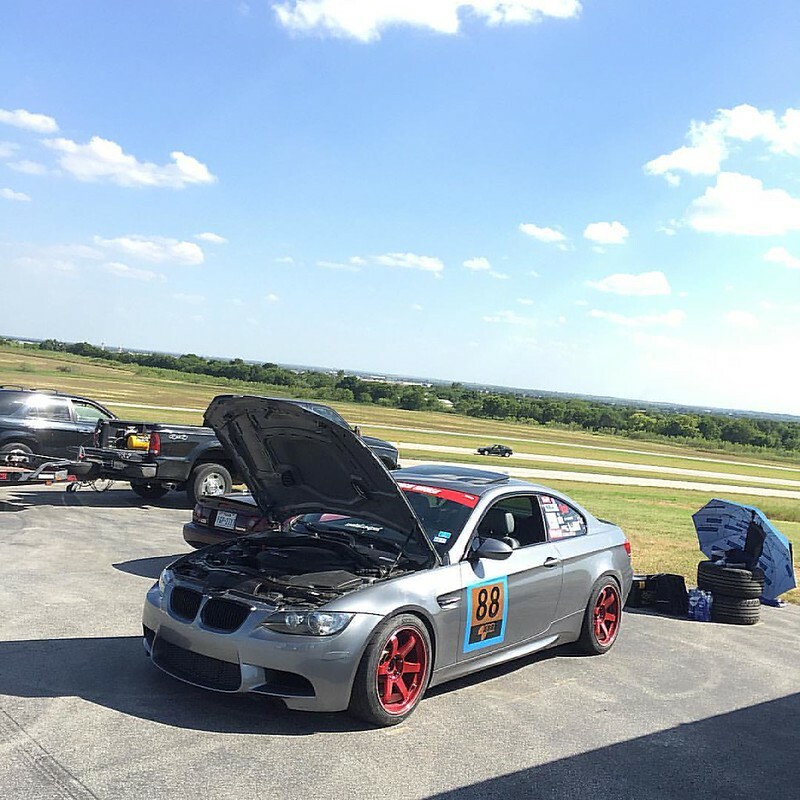 The guys at ABR Houston know how to work on BMWs and really take pride their work. ABR Houston also did my engine bearing replacement the beginning of this year. VAC coated bearing with ARP rod bolts and no problems so far. In a couple of months I would have been tracking the M3 for one year. 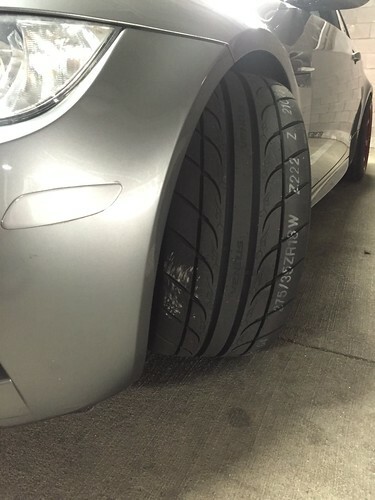 So far I have been through Michelin Pilot Super Sports (PSS), Nitto NT05 (2 sets) and now Hankook RS3. In terms of grip and track use I would rate Michelin Pilot Super Sports #3, Nitto NT05 #2, and Hankook RS3 #1. Now the NT05 and RS3 are both in the 200 treadwear category. 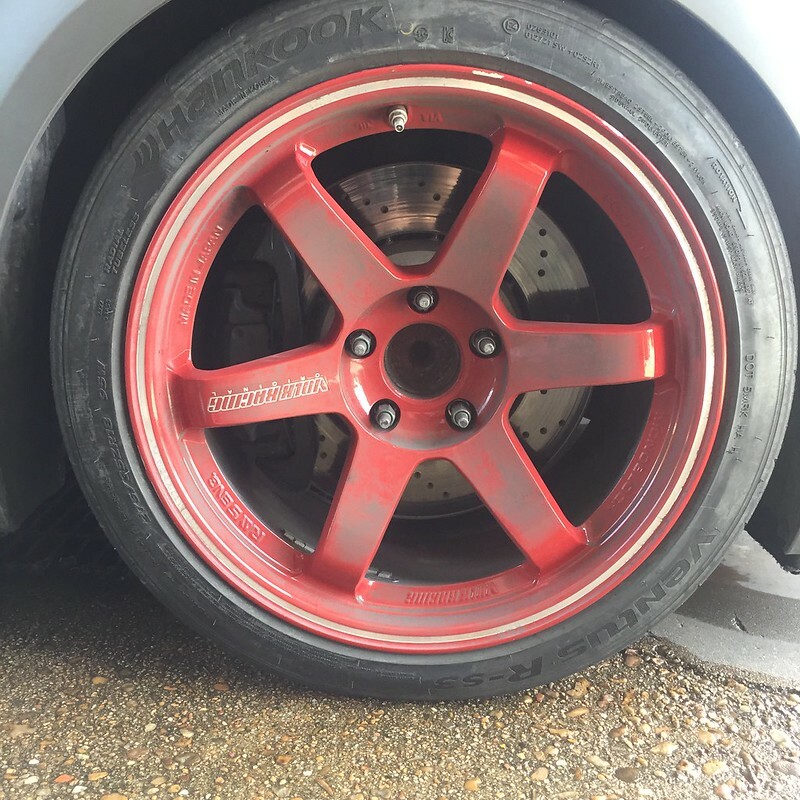 I was planning to buy my 3rd set of NT05s but I wanted to change things up and see if I could tell a difference with tires of the same treadwear. From what I can tell, it’s a big difference. The RS3 is slightly more expensive then the NT05s but its was something worth trying out at least once. With my brand new RS3 mounted, I recently had a track day to test them out. The levels of grip on the Hankook surpassed the grip of the NT05. Unfortunately my lap timer wasn’t working properly so I wasn’t able to get any data. Hopefully next month at MSR Cresson I’ll be able to acquire data. Subjectively, once heat cycled, the RS3 griped a lot better than the NT05. I felt more confidence to push the car harder after every lap. The tire warms up quickly usually after a couple of laps and the grip is just constant! I felt more g forces on the corners compared to the NT05. I didn’t have any sidewall scrubbing or overheated tries. The road noise of the RS3 is about the same as the NT05, I didn’t really notice a difference, but then again I do have a loud exhaust. Looks wise the RS3 isn’t aggressive looking as the NT05 but its something I can overlook. After tracking on the RS3s I don’t think I’ll ever go back to the NT05s. Don’t get me wrong though, the NT05 preforms well on the track. 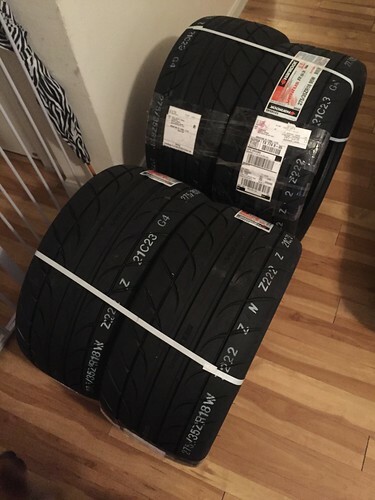 Its NOT a terrible tire at all, but if you are looking to upgrade to something better in the same tire category, then the RS3 would be a good tire choice.